Actually, for me the way to the falls is as wonderful as the falls itself. The rough ride through the gorge is very beautiful. 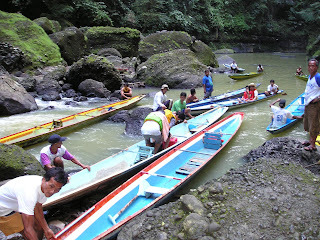 Two boatmen will take you to the falls in their banca navigating around the rocks against the current. At some point they even carry the boat to get through some of the rocks. This is where Francis Ford Coppola shot some scenes for " Apocalypse Now". After a 1-hour plus boat ride, and a barbecue break you will see the majestic Magdapio Falls. Be sure to negotiate the price with the boatmen first before jumping in the boat. There are standard rates that the town enforces to prevent what happened 10 years ago when the boatmen would leave the tourist in the middle of the river when they refused to give a huge tip. I think it is better to reserve the tour from a hotel in Pagsanjan or from a travel agency. It is also normal to pay for your boatmen's meal when they stop for a barbecue midway and to give a reasonable tip at the end of the trip. The illegal flaggers and the boatmen's request for large tips are a nuisance! Though the Pagsanjan Falls experience is great, they will be driving away tourists with their behavior. Never hire a boat from the illegal flaggers. I had been there 3 times with Europeans and have never been aggressed. We usually go hire a boat from a hotel. Doing it this way makes going to the falls quite hassle free. 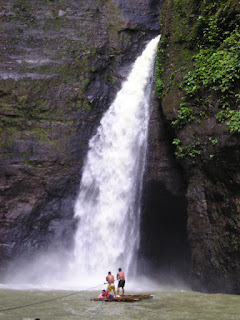 Your photos are very good especially in such blog design background.. Pagsanjan becomes more amazing in those pictures! My name is Weldon Day I was browsing internet and found your blog. The author did a great job. I will subscribe to your RSS feeds. Thank you for your contribution. I am a web designer myself. And here some examples of the websites that I designed for payday loans bad credit loans company.